Our Mush Push: What a Cool Idea! As a happy little cardmaker, this idea pleased me completely. A woman at work is participating in a gift project for a new mom. Twenty-one friends and family are making birthday cards for her newborn son. Each friend is assigned a different year. The woman I spoke to had his 6th birthday. When completed, the new parents will have 21 years worth of beautiful, handmade birthday cards for their child, all coming from family and friends who love this new little guy. I think this is such a cool idea that I wanted to share. To a non-cardmaker, this idea my sound challenging, but it is amazing what you can do with cool paper, stamps, buttons, ribbon and makers. If you've never made a card, you should give it try. You might like it. See this thing here. It's a paper trimmer. This is the Fiskars version. There are many out there on the market. When I first started making cards I purchased a smaller paper trimmer. Since then, I've upgraded a bit, but of all the supplies I've purchased, this is the the most practical and it has nothing to do with cardmaking. This thing has come in so handy for school projects, I can't even tell you. Trimming construction paper, articles, pictures from magazines or internet, this does it perfectly. Much, much better then scissors. I just wish I had this tool back when Stinky was in elementary school. My life would have been a lot easier. If you've still got kids in school, you might want to get a paper trimmer and save your fingers and your patience. Totally fun idea and your card is so cute. I totally think I should have one of these paper trimmers at my house. Is your upgraded one also a Fiskars? 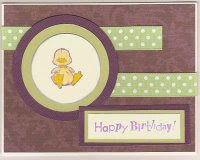 21 years of birthday cards for the newborn, what a cute idea. For some reason, I've had trouble getting into your blog, but made in today. My upgraded paper cutter is called a Carl RT-200 Professional Rotary Trimmer. I had to buy it online, because the local craft stores didn't have a trimmer that looked sturdy enough. I wonder why you were having issue accessing my blog. Hmmmm.